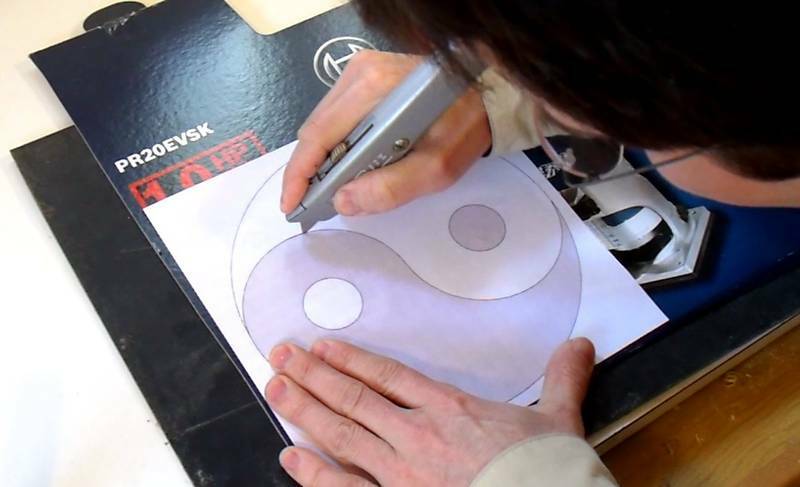 One of many the things the router pantograph can do is to make inlays using templates. 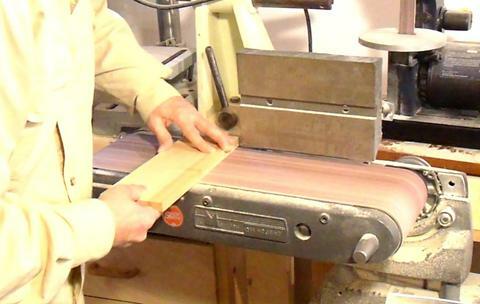 The conventional approach to template routing inlays is to use a router with a bushing riding against the edge of a template. But the nature of that sort of arrangement greatly limits the details that can be achieved. 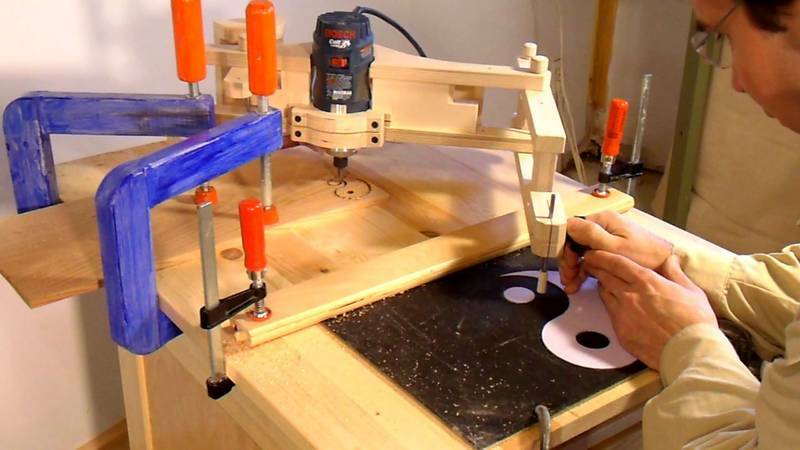 However, using a pantograph to scale and offset the template away from the workpiece gets around these limits. I start by printing out a scaled shape of the template I want to carve and gluing that onto a piece of thick boxboard or thin cardboard. 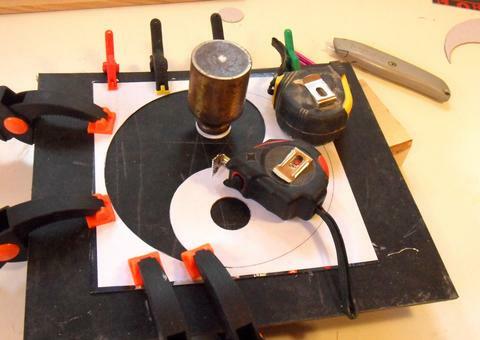 I'm going to use my pantograph set to 1/3 reduction, so my template needs to be three times actual size. 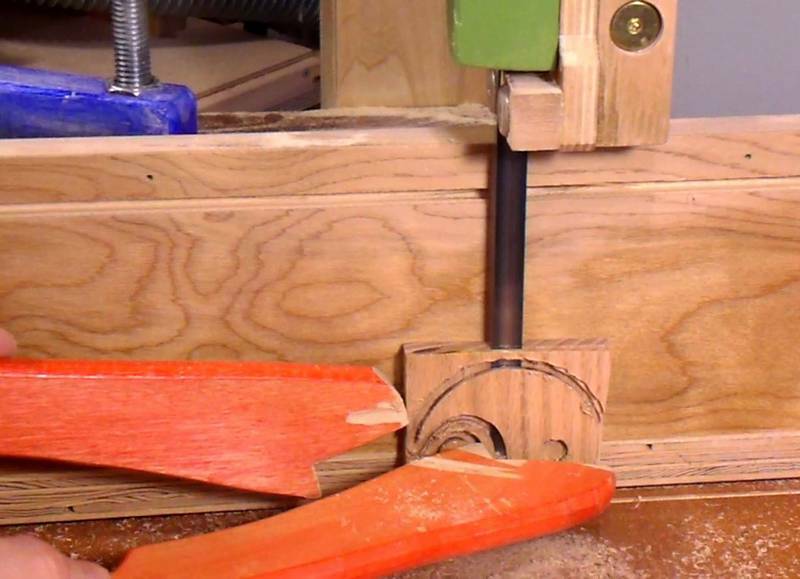 I figure with that much reduction, I should have plenty of accuracy for the routed shape. I cut out the template shape by scoring along it's edges using a very sharp knife. Popping out the scored template. I need to keep both the positive and negative shape for my procedure, which is why I scored along the edges instead of using scissors. Now I'm gluing the template down on a backing. 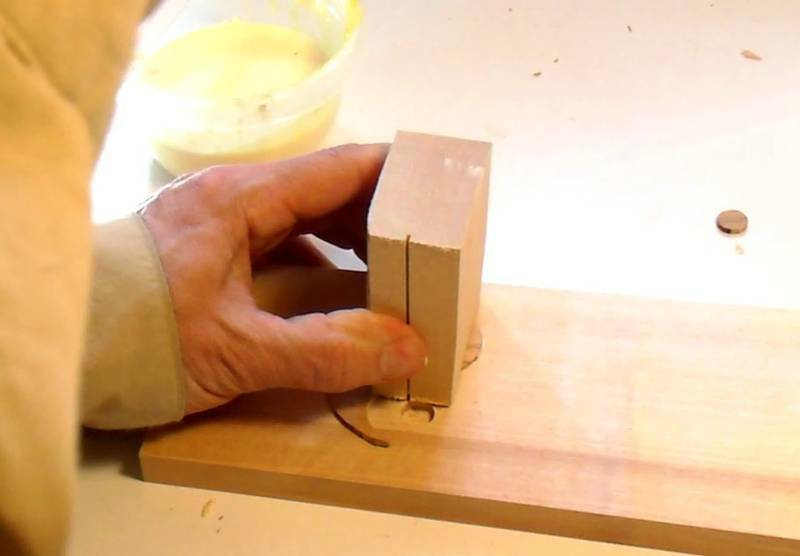 I'm using some hardboard, but boxboard or plywood would work just as well. 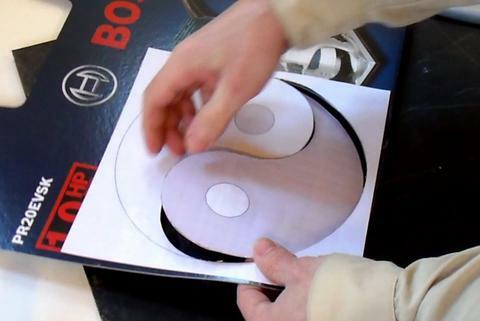 A tricky part with this yinyang shape is that the small circle needs to be positioned in exactly the right spot in the template. Otherwise, it won't align with the inlay shape that I'm carving using the other half of the template. 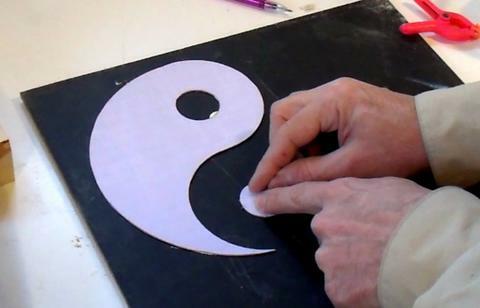 I positioned the small circle by placing the cut-out portion back in the hole and using that to position the circle. I use the cut away part of the template to make another template that I'll use to carve the inlay part. Fortunately, positioning the circle for that part is not critical because those parts will get separated before gluing them in. 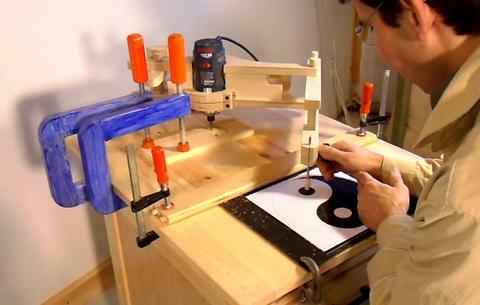 With my pantograph set for 1/3 reduction, I need a follower that is exactly 3x the size of the router bit that I'm using. 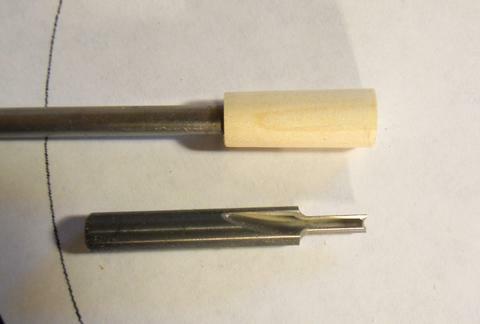 I'm using a 1/8" (3 mm) router bit, so my follower needs to be 3/8" in size. If I was aiming for a looser fit, I'd make the follower a tiny bit smaller. 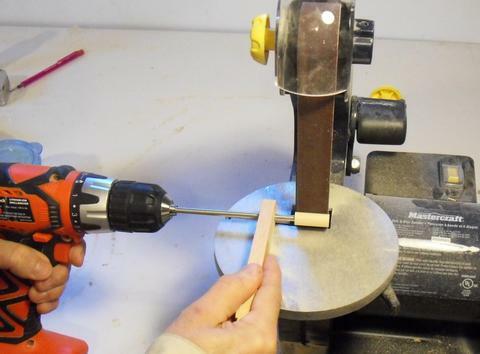 I made the follower by mounting a small block of wood on the end of the shaft, and then spinning it with a drill while holding it against a sander. The shaft passes through a piece of wood that I'm holding with my right hand. That piece of wood actually provides the reference. The procedure makes for a very round shape very quickly. 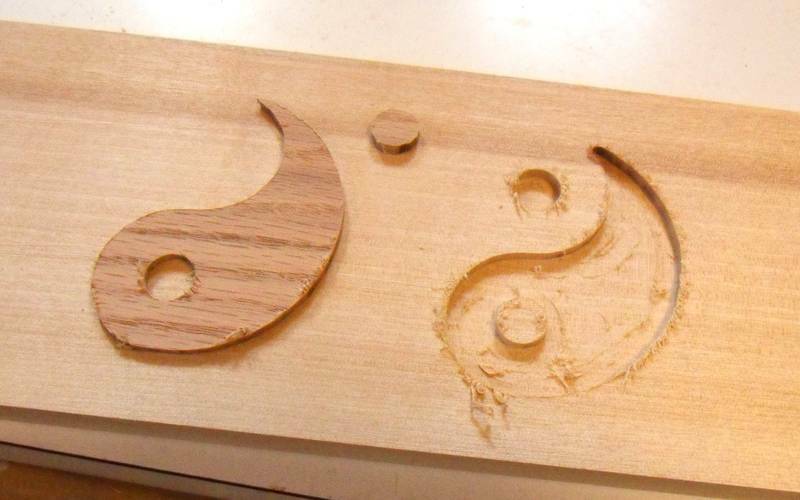 I had to be careful not to sand away too much. With the template and workpiece securely clamped on my router pantograph, it's time to carve it out. I used two of my long reach clamps to hold the workpiece down. At first I used just one, but I found that my stock would slip as I worked it. 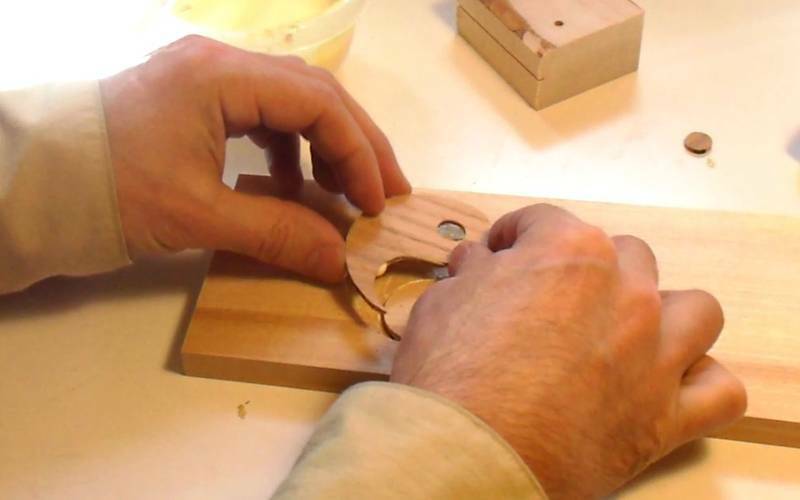 The routed cavity. 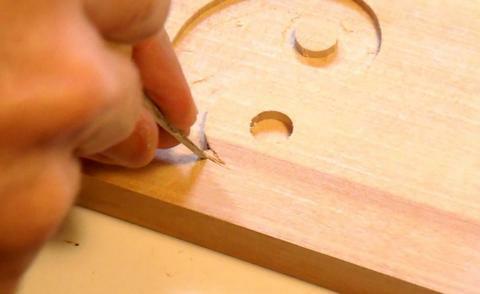 I had set the depth to about 3 mm, which is quite deep for inlay carving. It made for slow going in the birch hardwood. Next I switched to the other template and carved out the inlay portion in a piece of oak. 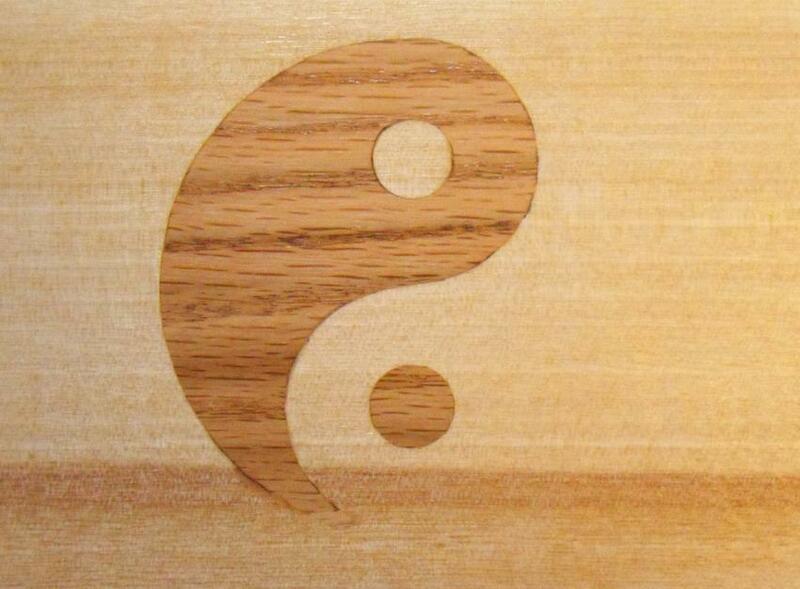 The inlay carved. I only need to carve out the outline of it, not the areas inside. I cut out a square around the area I had routed. 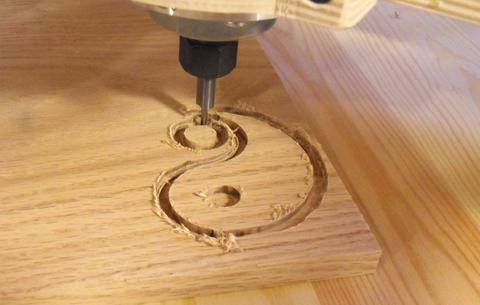 I then used my bandsaw to cut the carved shape off the block of wood. 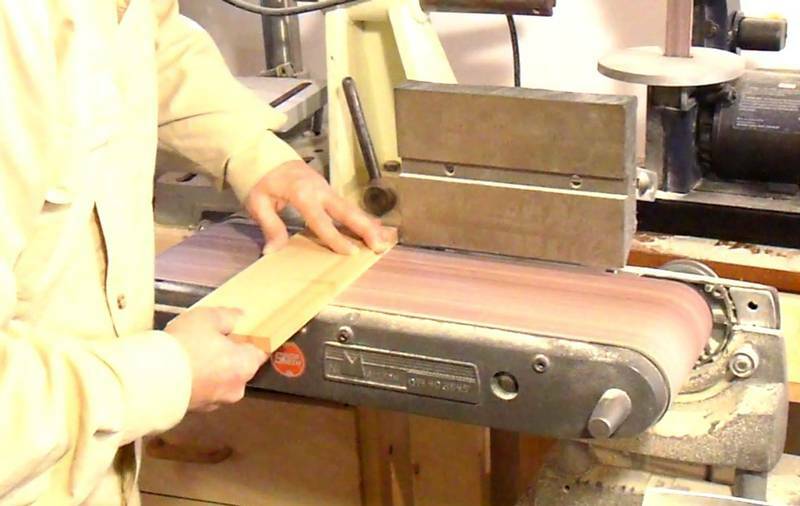 Orienting the wood grain vertically makes for a smoother, quieter cut with less likelihood of damaging the inlay pieces. The carved cavity and my inlay piece. Both still need a bit of sanding to clean up the rough edges. ...and then carved that out with a small chisel. ...so I used a block of wood and a mallet to whack it in. 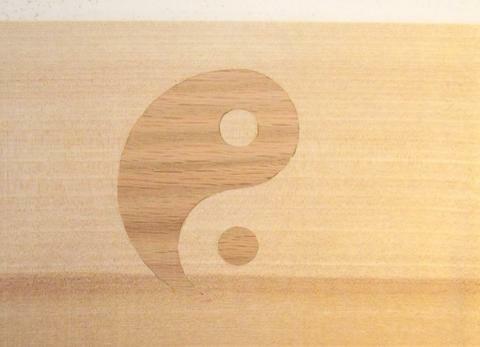 In the process, the tip of the tail of the yinyang inlay went flying. 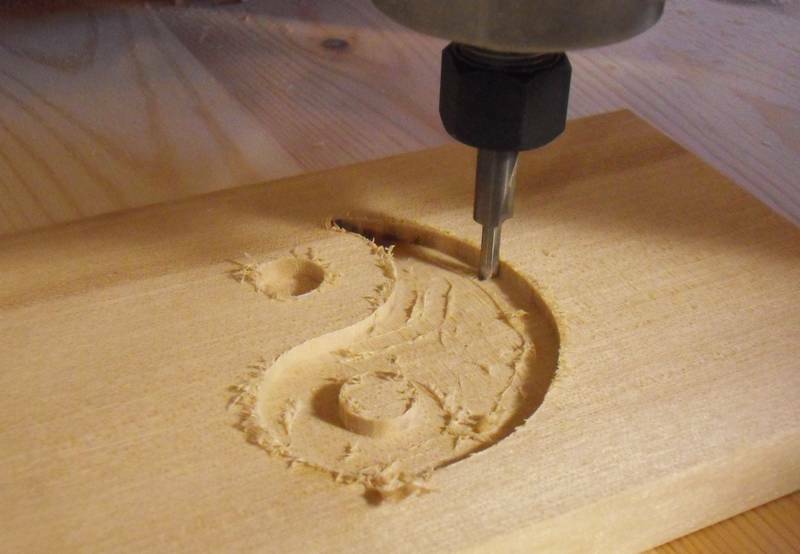 I had to carve a tiny piece of wood to replace it. Now rubbing some glue and sawdust on it, just to fill any gaps. Sanding it flush. 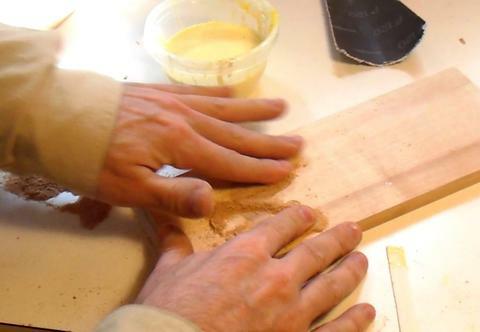 I'm being rather aggressive with the sanding, first sanding across the grain to remove material faster, then with the grain to make a smoother surface. The inlay is quite thick, so realistically, I could also trim it flush with a thickness planer. ...but some varnish on it really brings out the contrast that is there. The end result looks OK, but it's not perfect (click image to enlarge). Maybe I should have used a smaller follower for a looser fit. 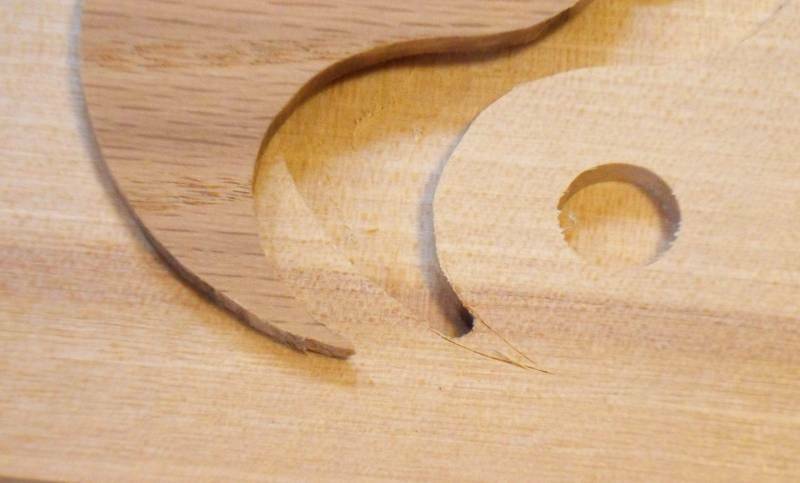 You can see some damage to the wood near the tail of the inlay from whacking it in so hard.